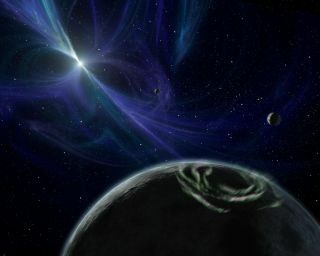 This artist's impression shows the planetary system around pulsar PSR B1257+12, one of two pulsars known to be host to at least one planet. Such planets around pulsars may have powerful electromagnetic wakes around them. Alien worlds that orbit the energetic dead stars known as pulsars may leave electric currents behind them – anomalies that could help researchers find more of these strange planets. Astronomers know of only four "pulsar planets" so far, and much remains unknown about such worlds, but scientists propose that they formed in the chaos after the supernova explosions that gave birth to the pulsars. A pulsar is a kind of neutron star, a stellar corpse left over from a supernova, a giant star explosion that crushes protons with electrons to form neutrons. Neutron star matter is the densest known material: A sugar cube-size piece weighs as much as a mountain, about 100 million tons. The mass of a single neutron star surpasses that of the sun while fitting into a ball smaller in diameter than the city of London. Pulsars spin extraordinarily rapidly, up to thousands of revolutions per second, and they flash like lighthouse beacons — hence their name, which is short for "pulsating star." They are also extremely magnetic — a kind of pulsar known as a magnetaris the most powerful magnet in the universe. Despite the exotic nature of pulsars, they have been seen hosting planetary systems. This image, which combines data from the Hubble Space Telescope (visible light), Spitzer Space Telescope (infrared) and Chandra X-ray Observatory (X-rays) shows the Crab Pulsar. The X-ray emissions (in blue) show the location of high-energy phenomena around the rapidly spinning star. The visible and infrared light (shown in red) traces the location of debris thrown out by the supernova that destroyed the Crab Pulsar's progenitor star. Mottez, lead author of a study into pulsar planets, and his colleagues suggested a new way to discover more of them: by looking for their wakes. Pulsar planets could be interacting with the winds of electrically charged particles streaming from their pulsars, leaving powerful electric currents in their wake, the researchers said. "In some circumstances, these currents would be almost as strong as those directly generated by the pulsar," Mottez said. These electric currents should generate radio emissions. "The detectability of these planets with radio telescopes is currently under study," Mottez said. Any world that survived the supernova that gave birth to a pulsar would be expected to have a very elongated, oval-like orbit. The supernova would have kicked the neutron star into motion at hundreds of miles per second, so planets that successfully followed these pulsars as they zoomed through space would have to move in comparably warped paths. However, the four known pulsar planets all have very circular orbits, and they dwell rather close to their pulsars, at distances comparable to those of Mercury, Venus and Earth. This suggests they formed after the supernova, from debris that collected together shortly after the explosion. The powerful magnetic fields and winds of particles from a pulsar should have profound effects on how planets form, and on smaller bodies such as asteroids and comets in its system, Mottez said. The scientists presented their findings Sept. 28 at the European Planetary Science Congress in Madrid.